Considering Google AdWords? Read This First. There are lots of tools, free and paid, that can help your small business get more attention and make more sales. 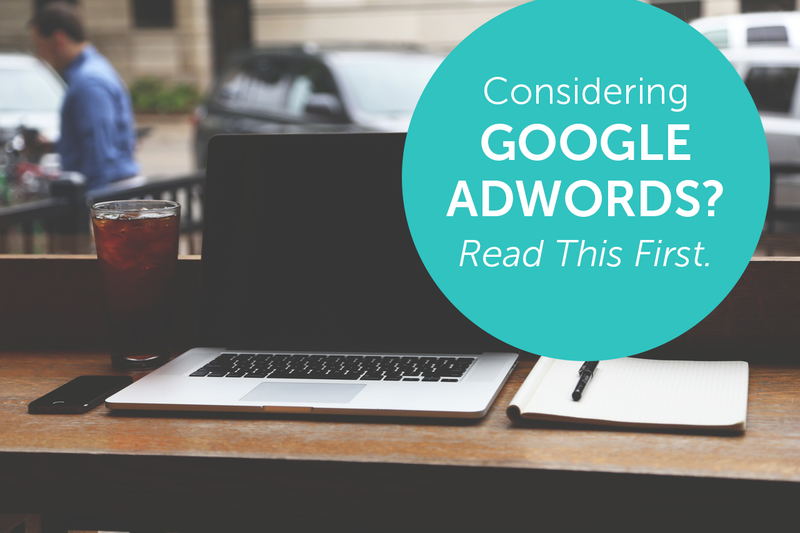 One of the most potentially effective is Google AdWords. It’s a proven way to win the attention of new customers and help boost your sales. But, as with everything else in the wild and crazy world of online marketing, you have to do it right in order to get the results you want. And you have to understand that it’s not a “magic bullet”. It won’t solve all of your marketing challenges. It won’t make up for a lack of online marketing strategy. So don’t get afflicted with “shiny object” syndrome with AdWords, should you choose to add it to your marketing toolbox. Use it as part of a comprehensive, well thought out approach to winning new business. In this article I’ll give you some valuable tips to help make your AdWords campaigns more effective. Frankly, ignoring them could cost you big time. But here’s what we won’t be discussing: the technical nuts and bolts of AdWords – keyword bidding, specifics of Analytics dashboards, etc. The web is loaded with valuable info on that subject. Once again, Google AdWords is not a sales and marketing cure all. It won’t make up for a poor product/market fit. And it won’t help you sell a product nobody wants. So what’s the biggest key to AdWords success? I’m going to say it’s demand for what you are selling. Make sure your product or service fits that category. And make real sure people are searching for it in Google. If they aren’t? Well, then AdWords won’t work for you, plain and simple. Also, since Google AdWords, if you use it, needs to be part of a comprehensive marketing approach, make sure every other part of your “marketing engine” is running smoothly. That goes for your SEO, your email marketing, your social media activity, copywriting (More on this in a moment), content marketing, etc. Will Your Ad Stand Out? Or Will It Get Ignored? Chances are your ad will face stiff competition. Don’t let this stop you from using AdWords. Do, however, take steps to get your ad noticed and clicked on. Pro tip: Once you determine the keywords buyers are using, include those in your ad. For example, if they are searching for “Dentist in Miami”, and you are a Miami-based dentist using AdWords to help you get new patients, use the phrase “Dentist in Miami” in your ad. This term is relevant to your searchers. They looked for it verbatim. Doesn’t it make sense that if they see that exact phrase when they look at the search page results, it will get their attention and make them more inclined to click on your ad? In AdWords, as in all of your marketing, good copywriting matters. Granted, you don’t have much space, but you want to give them a reason to click on your ad. So give them a powerful reason to click on your ad. Tell them briefly how you can benefit them, and have a call to action. Instruct them on exactly what you want them to do – i.e., “Click here now”. Are You Making This Big AdWords Mistake? AdWords can be a very useful tool that can help you market your business more effectively. But again, you have to do it right. A big part of doing it right is simplicity. Make the process as easy and seamless as possible. Do your very best to avoid confusing your potential customers. Confusion will destroy your conversion rates and your AdWords results! So what is this big mistake? Having viewers of your ads click through to your homepage. Consider this: They read your ad, want to find out more, click and then Boom! They are on your homepage where they may encounter a variety of messaging that does not relate to the ad they just read. Where do they go now? What do they do? They were experiencing momentum that was carrying them happily toward a sale. Talk about confusion. Now that momentum has been derailed. And there is a strong likelihood you’ve lost the sale. Have them click through, not to your homepage, but to a persuasive, relevant, targeted landing page. A landing page is a stand alone page on your website that has one purpose only: to help you make the sale. An effective landing page has a single call-to-action that drives visitors to the next step in the sales process. Make sure your landing page design is simple. Avoid distractions. Forget about social media sharing buttons, website navigations tabs, etc. You want them to make a decision – either follow your call-to-action or exit your site. In other words, you are persuading them to say “Yes” or “No” to your offer. So how do you get them to choose “Yes”? Make your call-to-action compelling and something they want to take part of. If possible, eliminate all risk. For instance, if you are asking them to buy online, have an ironclad money-back guarantee. Also, make it crystal clear what you want the reader to do. Want them to contact you by phone? Say so. Want them to download your free eBook? Tell them to download your free eBook. Want them to click the link to an order form? Tell them to do that. The copy surrounding your call-to-action will play a big part in your landing page’s success as well. Use the keywords you used in your AdWords ad, of course. Have a juicy, curiosity-generating, benefits-loaded headline that arrests their attention and makes them want to read more. Use copy that is focused on helping them solve a problem. Copy that reassures them and builds trust. After all, you are asking them to give you something – whether it’s money, an email address, or even their time. So reassure them that they are making a smart move. When it comes to Google AdWords, there’s a lot to learn about keyword research, bidding on terms and using the Adwords platform. But without relevant ad copy and an effective landing page for capturing leads, your Google Adwords spend will go to waste.